Jeremy Thiel: PAIN OR GLORY? 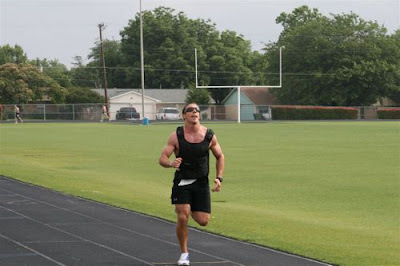 "the murph" one mile run 100 pull ups 200 push ups and 300 squats followed by 1 miles run. I decided to add the 20lbs vest to see what I was made of. I had a plan to break the workout into 4 pieces in between the runs 25 pull ups, 75 squats, 50 push ups... so I could recover my upper body. Well starting the third round I began to question if I was capable of finishing with the vest. By the way there was roughly 30 spectators watching the whole thing... with the added pressure of not looking like I took on to much I chose to finish with the vest and get it done. Pictured above is the final lap on the mile. The workout was hosted by CrossfitPlano.com for a great cause" a fitness competition to benefit the Special Operations Warrior Foundation (www.specialops.org). SOWF provides college scholarship grants, not loans, to surviving children of Army, Navy, Air Force and Marine Corps special operations personnel killed in combat or training missions." All I could think of on the last mile was all the soldiers in Iraq who carry 80lbs packs in 100 degree weather day in and out and I was crying about 20 lbs and less then an hour of work. Oh how I was humbled once again by a great Crossfit workout. Thanks to all the American Soldiers who have given there lives to service for our great country.